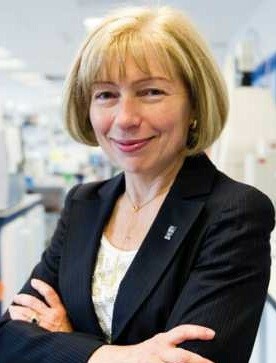 Professor Dame Anna Dominiczak is Regius Professor of Medicine, Vice Principal and Head of the College of Medical, Veterinary and Life Sciences at the University of Glasgow, as well as an honorary consultant physician and a non-executive member of NHS Greater Glasgow and Clyde Health Board. She is one of the world’s leading cardiovascular scientists and clinical academics, awarded a DBE for services to cardiovascular and medical science in 2016. Her research interests include hypertension, cardiovascular genomics and precision medicine, where she is an active champion of the triple helix approach of public, private and academic collaboration. She is a Fellow of the Royal College of Physicians, the American Heart Association, the Academy of Medical Sciences, the Royal Society of Edinburgh, the European Society of Cardiology and the Society of Biology. Professor Dominiczak has served extensively on national and international research committees and advisory boards, including those of the Academy of Medical Sciences, the Royal Society of Edinburgh and Wellcome Trust. She is Chair of the Medical Research Council’s (MRC) Translational Research Group, a member of the MRC’s Strategy Board, a member of the Medical Schools Council Executive and Chair of the Equality and Diversity Working Group of the Medical, Dental and Veterinary Schools Councils. She is also a Trustee of the British Heart Foundation. Professor Dame Anna Dominiczak joined the SSAC on 01 January 2019.